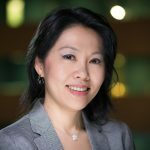 Global smartphone demand returned to a modest positive growth after a flattish first quarter as the seven out of the top ten smartphone brands were Chinese, together capturing a third of the smartphone market. 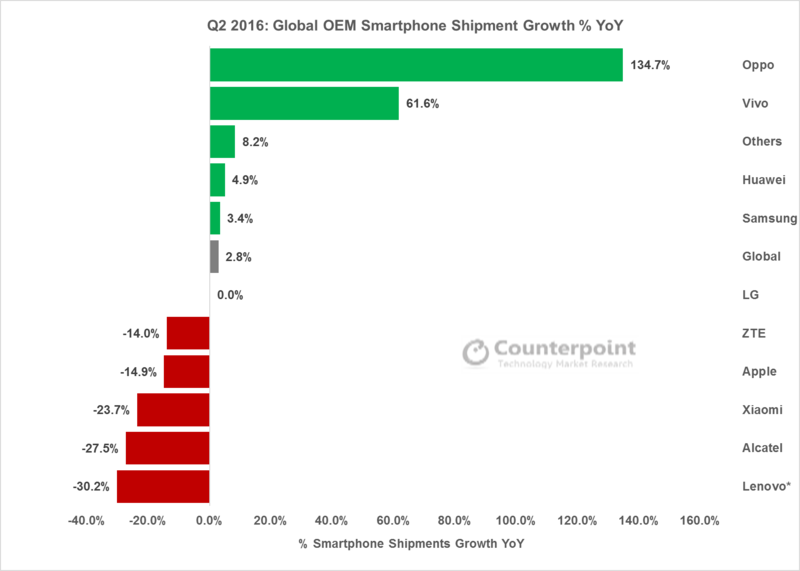 According to the latest research from Counterpoint’s Market Monitor service, the global smartphone shipments grew 3% in Q2 2016. Smartphone shipments reached 360 million units in Q2 2016 with YoY growth of 3%. After a steep sequential decline in Q1’16 the sell-in grew sequentially by 7%. Top 10 brands contribute to almost 70% of the smartphone volumes in Q2 2016. However, sell-in was tepid during late Q2 as unit production was reduced after weak demand signals from markets like Latin America but high growth markets in SEA registered healthy sell-in during Q2 2016 and supply constraints for key components from Taiwanese suppliers. The quarter was dominated by Chinese brands which continue to scale their operations both in their domestic market and beyond. Chinese brands like Huawei, Oppo & Vivo continue to scale fast and now setting up benchmark in mid to high end flagship segment on account of their impressive designs and aggressive pricing. Samsung led the smartphone market by volume with a market share of 21%. 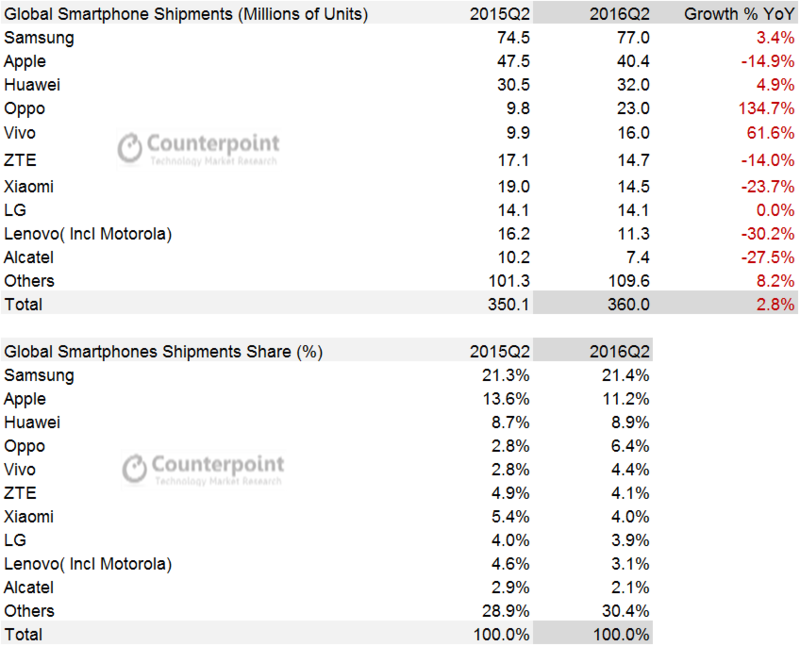 Its smartphone shipments increased 3% YoY reaching 77 Mn units during the quarter. Its latest Galaxy S7 series continue to give it a strong momentum in premium flagship segment during the month of its launch. In emerging countries, the J series continue to drive volumes as it successfully refreshes its key J series 2016 versions during the quarter. Apple shipments declined by 15% YoY to reach 40.4 Mn units during the quarter. 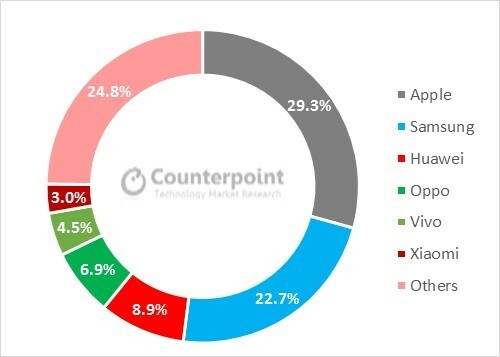 Huawei continues to be among top three smartphone brands globally and with its smartphone market share increased to 9% as compared to the last quarter. During the quarter it successfully ramped up its retail presence with 116% YoY in its number of stores globally. Oppo with the highest YoY growth among Top 10 brands secured fourth spot with 6.4% market share. Vivo too saw strong quarter with shipments grew 62% YoY reaching its highest ever 16 Million units. Apart from this its performance in overseas market was also strong. ZTE and Xiaomi captured fifth and sixth spot in the Global smartphone market. Huawei, Oppo and Vivo were the only Chinese brands among Top 10 to show positive YoY growth. Apple led the smartphone market with a 29% revenue share down from 38% a year ago. Samsung followed Apple with 23% revenue share and managed to narrow the gap due to strong performance of its flagship GS7 series along with lower ASP A & J series. Apple and Samsung together now control almost half of the smartphone industry revenues with 800 brands competing at the same time. Huawei, Oppo and Vivo were the star performers with revenues growing 84%, 152% and 66% annually with strong performance in domestic market as well as overseas market.